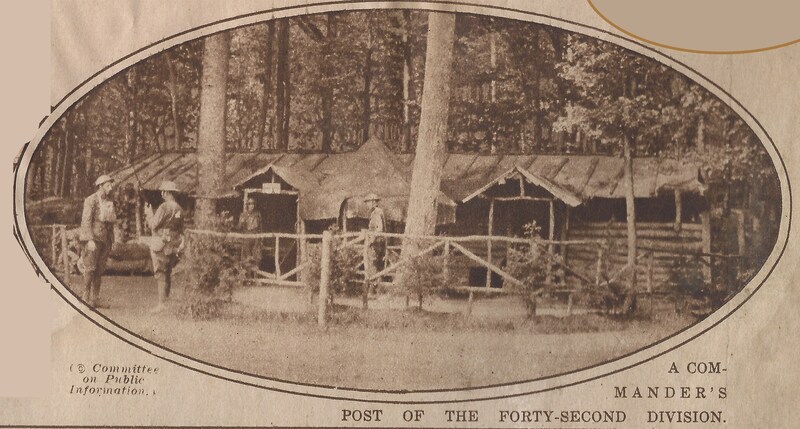 The 42nd: Shell Shelters, Headquarters, and In the Trenches. This Veterans Day, like most Veterans Days, I honor my veteran ancestors. This day was originally known as Armistice Day because an armistice – the cessation of hostilities – went into effect on the 11th hour of the 11th day of the 11th month in 1918. 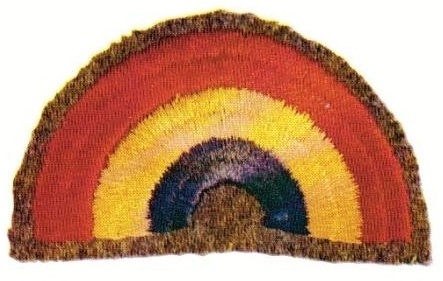 Original 42nd Division Rainbow Patch. Today, I also take a look at the men of the Forty-Second Infantry Division, U.S.A. Known as the “Rainbow Division,” Douglas MacArthur suggested its formation from multiple states that would “stretch over the whole country like a rainbow.” The division was created in 1917 from 26 states, including Maine, and was one of the first divisions of the American Expeditionary Force to go to Europe. Douglas MacArthur was promoted to Colonel as the Division’s Chief of Staff. The photo below is of some of the Forty-Second Division soldiers hanging out at a shell shelter. 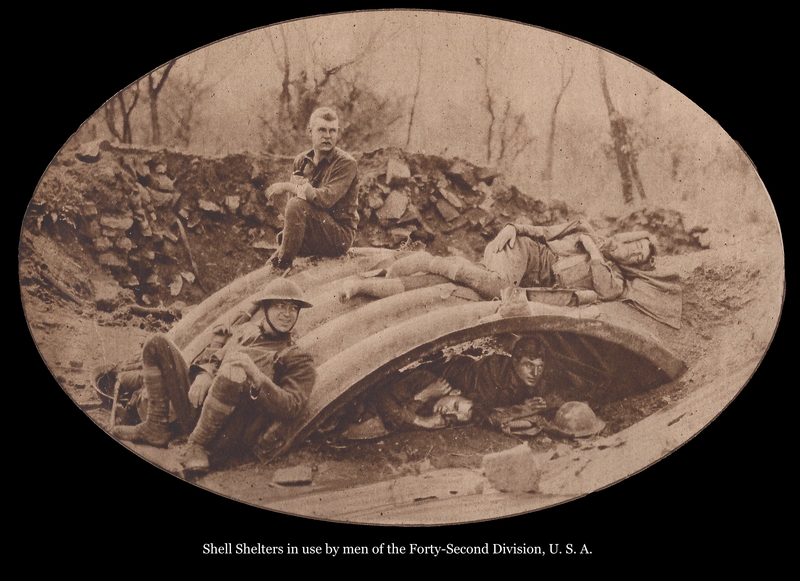 Two of the men are sleeping, one on the cold ground, the other on what looks to be a really uncomfortable ridge of the shell. However, it is the expressions of the other soldiers that makes me wonder. They are all looking at something off to their left. Two of the men have odd smiles on their faces. I wonder what they are seeing. Something definitely interesting. Next, we see a commander’s post. It is unclear if this with the 42nd Division’s command post during the Champagne-Marne campaign (15–18 July 1918) or sometime before that. 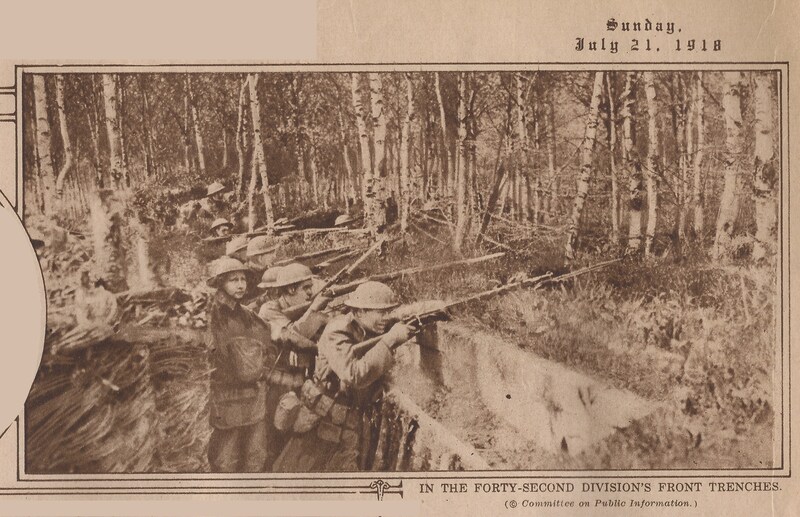 Finally, the New York Times gives us a glimpse of the 42nd in the trenches. Crowded, guns at the ready, bayonets affixed. Ready for combat. From March until July, 1918, the Germans were losing about 20,000 soldiers a month on the Western Front. Total causalities were well over 100,000 soldiers a month during the same period. Four months after this picture, the armistice was signed and the bloodiest war in European history (at that time) was over. Yes, today is a day to remember our veterans and thank them for their service. But it is also a day to reflect upon the “war to end all wars.” As a Vietnam veteran, I wish we could just find a way to only create peacetime veterans and not have any wars. Deterrence is better than battle. Previous Previous post: Why I’ll never do business with MyHeritage again.